Leaves of a norway maple in Bangor exhibit signs of "tar spots," a fungus that has been aggravated by the wet weather early this summer. The infections, which are not fatal to the trees, cause the leaves to fall to the ground in the summer. If you look closely at the trees, the Norway maples in particular, around where you live, you’ll likely notice the leaves aren’t looking so good. Covered in black blotches, the leaves’ sad conditions are a direct correlation to the overly damp start to summer. The culprit? The black tar spot fungus. 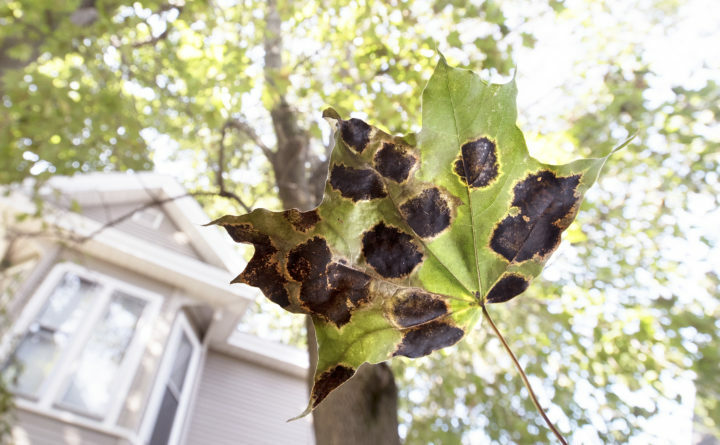 The black tar spot fungus affects Norway maple trees, which are native species of Europe, not New England, according to William Livingston, a professor of forest resources at the University of Maine. However, the trees are prevalent throughout much of the northeast. This specific fungus does not impact the region’s native maple trees. In August and until the trees start to defoliate in late September or October the fungus can be identified in the form of black spots on the leaves of the trees. The spots vary in size but can be as large as a nickel and are ringed by a yellowish halo. While the fungus becomes more visible towards the middle and end of summer, the stealth disease claims the Norway maple leaves as its victims as the leaves are budding in the spring. At this time, any infected leaves that remain on the ground from the previous fall can release fungal spores that have remained dormant, Livingston said. Since fungi thrive in moist conditions, a wet spring can amplify the spreading of these spores, as it did this year. Some tar spots are noticed on the leaves in lower canopy of trees, where conditions typically are the most moist, but Bergdahl said the conditions this year are much worse, especially in Greater Bangor and central Maine. “This year it’s so bad, and we had such prolonged periods of moisture that entire trees are infected from top to bottom,” Bergdahl said. Even though the trees look blighted with the blackened leaves, the tar spot fungus is generally not detrimental to the health of the overall tree, Bergdahl said. No one should run out and starting cutting down their trees. The harm is being done to the leaf itself. If there are bad outbreaks of the fungus several seasons in a row, Bergdahl said, the health of the tree could be impacted. He said that situation is not likely. Since the fungus is using the leaf for food, in some instances black tar spot fungus can lead to the early defoliation of trees, which Bergdahl said is happening. However, if this defoliation begins in September it is not a huge issue, given that by this time of year the trees have already generated about as much food as they are going to for the season, Livingston said. In addition to the tar spot causing some premature defoliation, the dry conditions that have persisted through much of mid- and late summer also are “exacerbating” this year’s early defoliation, Bergdahl said. Because the fungus is causing Norway maples to drop their leaves early, those trees might not be dazzling any leaf peepers this fall. But the early defoliation of leaves that carry the tar spot fungus could be beneficial to preventing further outbreaks in a forest setting, according to Bergdahl. With the tar spot leaves falling first, they will be covered on the forest floor by other leaves not carrying the fungus, which will lessen the risk that they could release their fungal spores if conditions are ripe next spring. The best thing people can do right now with the blighted leaves is to rake them once they have fallen and either bag them and dispose of them or burn them in a safe environment, Bergdahl said. Correction: An earlier version of this story misspelled Aaron Bergdahl’s name.